Paste paper 22, resize to 80%, apply your mask, delete and merge group. Paste frame 3, resize to 65%, click inside with your magic wand, expand by 4, resize paper 13 to 80%, paste, invert, delete, select none. Resize your tube to 70%, paste off center to the left. Resize element 57 to 70%, place below the tube layer, duplicate three times more and move one to the right more and the other two below the frame layer and up a bit, and to make the snow blend better, take your eraser and hit lightly on the tube snow. Resize element 3 to 30%, place on the right below the tube layer. Resize element 74 to 60%, place on the left just above the frame layer, duplicate, move to the right to the bottom layer, duplicate two more times and move over to the right more on one and a little more to the center with the other one. Resize element 34 to 50%, place below the snowman. Resize element 35 to 50%, place on the right in front of your tube. Resize element 44 to 20%, place on the paper you just pasted. Resize element 16 to 25%, place below the bells. Resize element 72 to 45%, place behind your tube. On the original element 72, resize to 65%, move to the bottom layer and upper left side, duplicate, mirror, adjust. Resize a couple of elements to 15%, place where you like on the snow. Resize element 59 to 50%, place below the frame layer on the right. Resize element 5 to 25%, place on the right side. 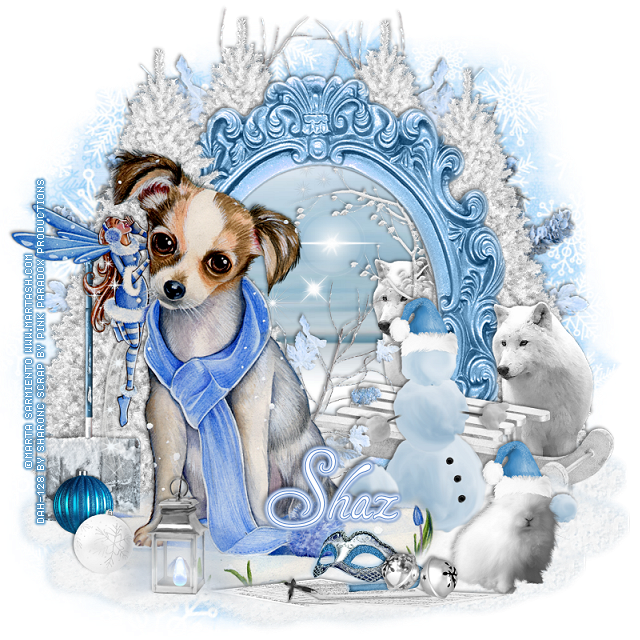 Resize element 15 to 13%, place one on the snowman and the other on the small dog. Resize sparkle element 87 to 45%, move below the frame layer. Resize element 32 to 45%, place on the left behind your tube. Resize element 36 to 35%, place on the right just above the frame layer, duplicate, move into the frame area and below the branches. Resize element 33 to 25%, place on the left in front of your tube.